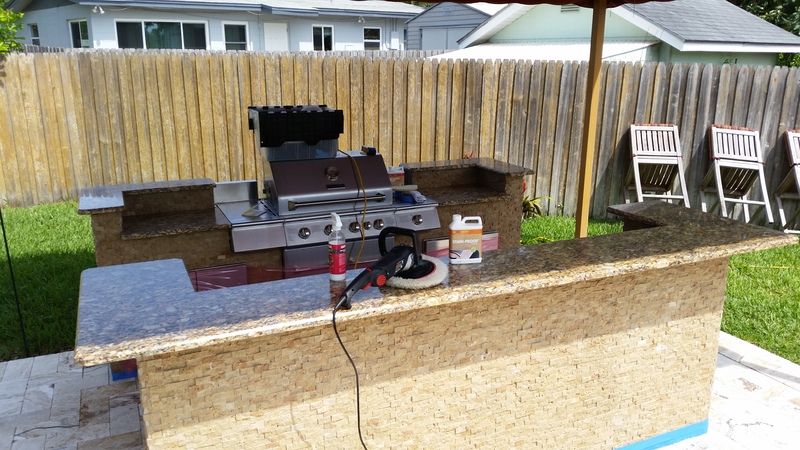 Comments Off on Should I seal my granite countertops? This is often a question that we get asked either via phone, email, or in person when we are performing other cleaning and sealing services in a home. Often a new home will have granite, travertine, or marble surfaces installed without ever being sealed. This is usually determined after something has already stained the surface or grout. You may also purchase a previously owned home and have no idea what was already done to these surfaces. A very simple test can be done on any surface to find out its porosity. You can take a tablespoon of water and pour it on the area in question. If the surface darkens, then the water is penetrating it. If water penetrates a surface, oils will more easily penetrate the same surface. So, should I seal my granite countertops? Granite sealer penetrating into the stone. Some granite (most of the time darker) may not darken at all or very little as opposed to lighter colored granite. 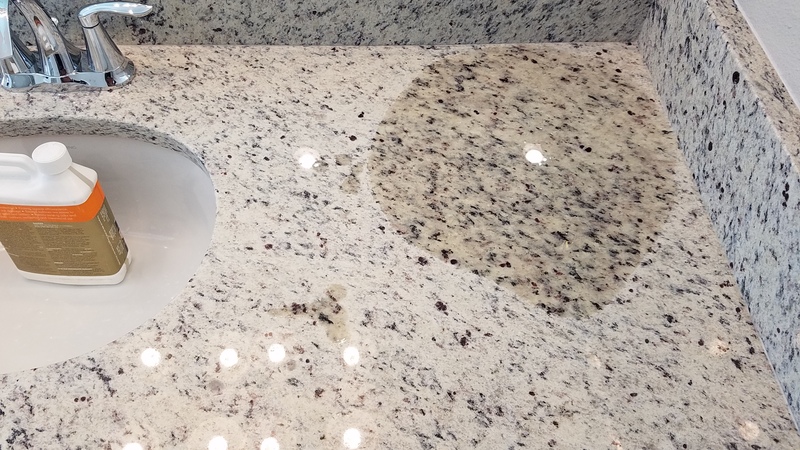 Granite is vulnerable near your sinks and cooking areas. Oils are more common in those areas and can stain or darken the granite. It can be repaired but is usually costly to do so. The granite that does not darken with water may already be sealed properly or is a higher quality denser granite and may not need to be sealed. You can always pick a corner of the granite and put a drop of olive oil on it to see if it darkens. If it does, you can either be very careful cooking or have it sealed with a sealer that will protect against those oils. Now the choice is up to you. Properly (key word here) sealing any surface will help protect it from staining. You can either try it yourself with a sealer from a local store or hire a professional who knows what sealer to use, how to apply it, and will warranty the sealer. Sealers will only last as long as you take care of them and the surface they are protecting. Improper cleaning techniques will reduce the life and effectiveness of most sealers. 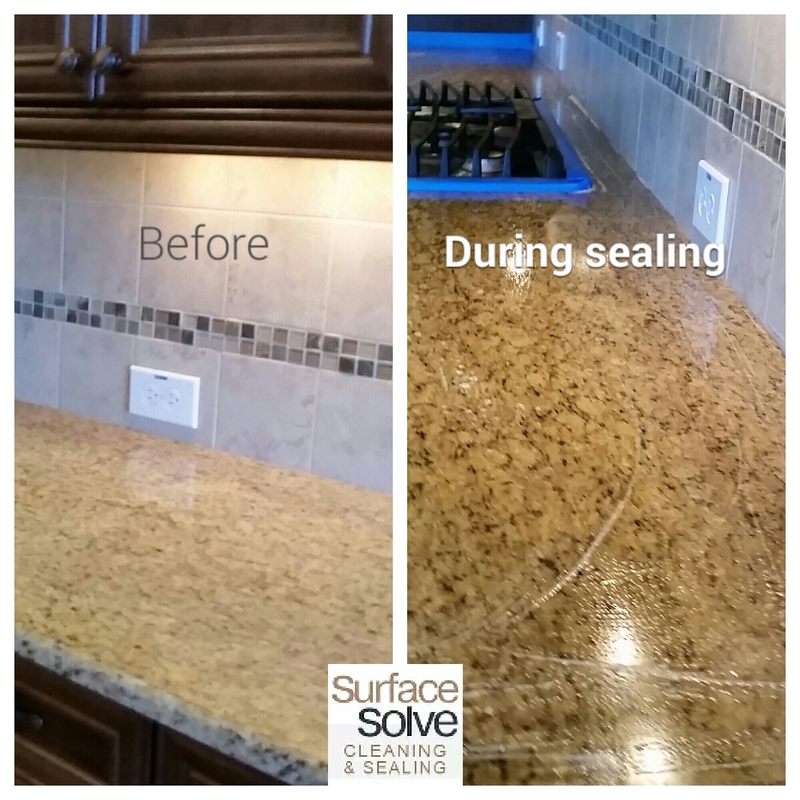 When we seal granite, we properly prep the surface and use a cleaner that will unclog the pores in the stone. This will allow the sealer to penetrate properly and more deeply for better protection and life expectancy. We then apply the sealer, allow it to penetrate, take off excess, then repeat. We are pressing the sealer polymers into the surface. We also use sealers that continue to migrate through the stone and not just stay on the surface of the stone. We never apply any type of topical sealer or treatment to a porous stone. Topical sealers have their place, but not inside a home. We have a variety of options for sealing stone inside a home. Your granite countertops are very expensive to replace if they become stained. A simple cleaning, sealing, and polishing process can set you up for peace of mind to keeping these beautiful surfaces looking beautiful. Contact us with any specific questions regarding your stone surfaces.